For many businesses, commercial roof coating is a solution when problems arise. Less costly than total roof replacement, professional coating can extend the life of your roof when installed correctly. That said, many business owners are left disappointed and with less than satisfactory results. Why is this? Our Atlanta commercial roofing experts know why failure occurs all too often. Inexperience. When a company employs crews that are not knowledgeable about essential steps that must be taken when installing a commercial roof coating, you can expect failure. Failing to clean the roof properly, inspect seams and penetrations to determine if fabric is needed over seams, and other steps in the preparation process will result in failure. It is not a case of slapping on a coat of paint, as many people imagine. Less than high quality products from manufacturers that may not be reliable. The old adage “You get what you pay for” is true in many cases, and in this case a coating product of a lesser quality will result in poor performance. There are huge differences in silicone and acrylic coatings, and considering there are countless manufacturers of these products and more coming on board every day, it’s hard to know whether you’re getting the best quality roof coating available. This is a critical point when it comes to the company you choose to do the work as well. The roofing company and crew should be well educated about which are the most dependable, effective products to ensure your roof is in the best condition possible when the project is complete. Application when the roof is wet or damp. 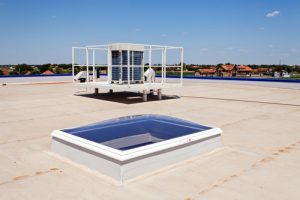 Unfortunately, many companies will go ahead with the job and install the coating when the roof is wet or even slightly damp from dew, something that should never be done. It’s also critical to ensure the insulation beneath the roof is dry before applying a coating; this can be accomplished when contractors perform infrared scanning prior to starting the project. At Kelco Roofing our commercial roof contractors in Atlanta are highly skilled and knowledgeable about every aspect of repairing, installing or coating industrial roofs. Commercial roof coating can be the right solution, but only when the job is done right and the products used are quality products! Give us a call today and enjoy peace of mind knowing your building is in reliable hands.